The Dallas Cowboys were one of the most dominant teams of the 1990’s, recording three Super Bowl victories in a span of four years thanks to the production of a prolific offensive unit highlighted by Emmit Smith, Troy Aikmen and Michael Irvin. 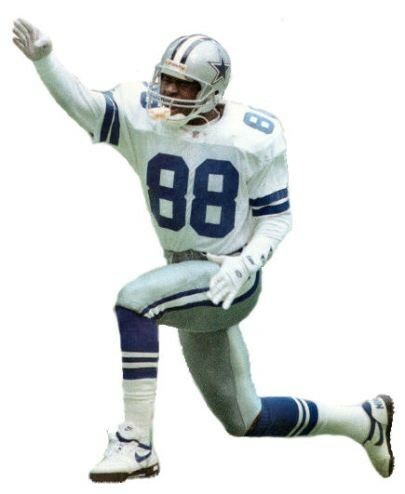 Michael Irvin may not have been the most explosive or talented receiver to play professional football but what he lacked in natural ability he more than made up for with commitment, work ethic and love of the game. After showing tons of potential at the high school level Michael Irvin attracted the attention of many college football programs, though no program recruited Irvin more heavily than the University of Miami, which would ultimately be Irvin’s destination. At Miami, which was under the guidance of future Cowboys head coach Jimmy Johnson, Michael Irvin blossomed into one of the best collegiate receivers in the nation. In his senior year Michael Irvin paired with future Cowboys quarterback Steve Walsh to lead the Miami Hurricanes to a victory in the 1987 National Championship game over the Oklahoma Sooners. When Irvin left Miami for the NFL after the 1987 season he did so in possession of almost every career receiving record kept by the school, including career receiving yards, catches and touchdowns.